Bowser with the Sick status in the remake. Sick is a status ailment in Mario & Luigi: Bowser's Inside Story. 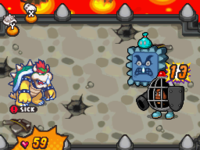 Certain enemy attacks, especially those from Blizzard Midbus, sleeping Naplocks, and Sniffle Thwomps can cause Bowser to become Sick if they hit. When sick, Bowser glows blue around him and has a runny nose. Every turn, Bowser sneezes and lose a chunk of HP, ranging from either 15, 30, 60, 75, 90 or even 120 HP. It is much like Poison that Mario and Luigi can be inflicted with, although Bowser is the only one who can get Sick and he cannot be poisoned in the traditional sense. In Mario & Luigi: Bowser's Inside Story + Bowser Jr.'s Journey, the aliment disables Bowser's ability to inhale. It also disables the command to press when using his flame ability. Another enemy in the game called a Sniffle Thwomp starts off the battle sick but doesn't actually have the status effect, but it does take damage every turn and can make Bowser sick or it can poison the bros. This page was last edited on February 4, 2019, at 22:14.